The nurturing and innovative sanctuary of holistic healing and wellness features 10,000-sq.-ft. of ultra-luxurious facilities, a ground-breaking “fusion wine” vinotherapy spa concept based on a blind tasting of wines, and a signature treatment menu. Discover Europe’s first ‘Spa Sommeliers’ who guide guests on their wellness journey, while providing the highest level of guest service including Spa Butlers who welcome guests and assist at every step of their spa experience. Among the new spa’s guest facilities are: four individual treatment rooms, a Spa Suite, outdoor rain showers, indoor heated pool, outdoor pool with a snack menu, and separate ladies and men’s wellness areas each with a sauna, steam baths, experience showers, hydrotherapy pools, relaxation room and changing areas. Among the well-being offerings are Pilates, personal training sessions, yoga, meditation and Qi Gong. The Spa Sommelier is a transformational concept, and the touchstone to the success of El Santuario: a consummate professional with a critical role in the spa experience – to interpret and apply synergistic principles and practices, analyze and determine the needs of guests, and recommend effective treatments that enhance wellness and wellbeing. 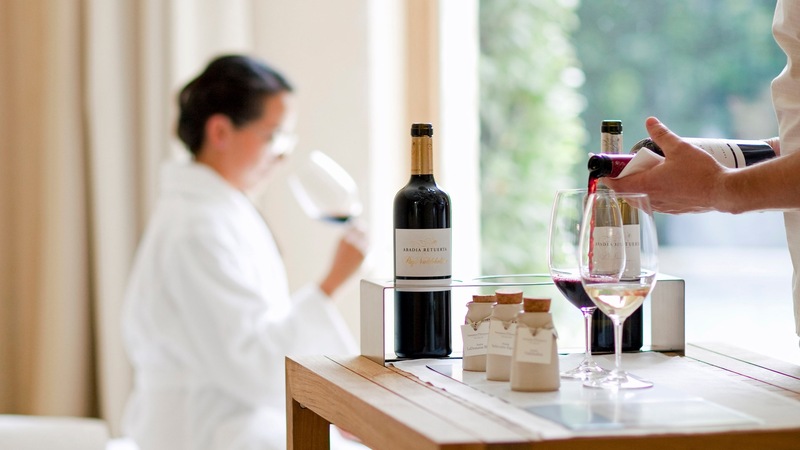 The Spa Sommelier conducts a ‘blind tasting’ – of oils to smell and wines to taste – and depending on palette and aroma preferences, designs appropriate spa experiences to target the guests’ physical and spiritual needs at that specific moment in their wellness journey. For guests who do not drink alcohol, the wines are replaced with seasonal teas and juices. El Santuario’s menu connects guests to the two defining aspects of Abadía Retuerta LeDomaine: The hotel is a classic property with a 900-year-old history, and so the menu offers a full range of classical spa treatments and services, while the abbey’s deep-rooted wine culture is embodied in a bespoke fusion-wine vinotherapy spa concept of personalized spa journeys based on local wine traditions. Le Grand Cru, for example, is the ultimate oenotherapy experience combining a soothing footbath, body exfoliation with grape seeds and essential oils, vitamin drink, nurturing anti-aging body wrap and soothing pumices massage. In order to maintain the property’s historic ambiance, the modern spa was built underground, below the abbey’s original stables – which brought the significant architectural challenge of overcoming the exceptionally high moisture level of the soil due to the proximity of the Duero River. The architect came up with an ingenious concept to solve the problem: he designed an impermeable “shoe box” structure and built the spa inside of it. Simultaneously, the stables were converted into eight additional guest rooms with direct spa access. The new guest rooms bring the hotel’s total to 30 rooms and suites. Setting the table for guests’ spa experiences is nutritious, healthy and light Spa Cuisine – that is also tantalizingly delicious. The menu was created by Pablo Montero, the hotel’s Head Chef – who in November 2014 earned a Michelin Star for LeDomaine’s Refectorio restaurant – in conjunction with his mentor, Andoni Luis Aduriz, who is one of Spain’s superstar chefs and restaurateurs as well as LeDomaine’s Gastronomy Manager. 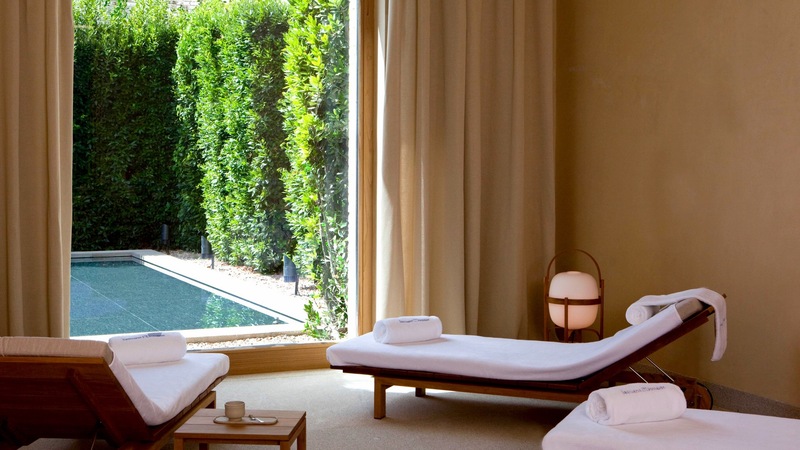 El Santuario is among the most energy-efficient and sustainable spas in Spain. A system with state-of-the-art technology uses solar panels and groundwater pumps to generate energy for heating and cooling. Geothermal storage systems compensate for the seasonal fluctuations in energy demand. A dedicated water-treatment plant allows water to be recycled and used for irrigation. Imbued with the charm and lore of a by-gone age, Abadía Retuerta LeDomaine takes guests back in time while immersing them in the comforts and luxuries of today’s most savvy hospitality. The medieval abbey and estate of LeDomaine, dating from 1146, is a grand travel experience that overwhelms the senses with its enduring history, stately architecture, majestic ambiance, world-class culinary experiences by one of Spain’s top chefs, acclaimed vineyards recognized for their award-winning single terroir wines, and regal accommodations. Abadía Retuerta LeDomaine opened in 2012 after a complete restoration that sensitively and imaginatively brought the historic property into the 21st century – and earned it a Europa Nostra Award from the European Union for conserving cultural heritage. It arrived on the Spanish tourism scene offering several firsts including the country’s first hotel to offer a complete butler service and the only Spanish establishment to be included in the 2013 edition of the prestigious Relais & Châteaux hotel and restaurant guide. Guests have three dining choices: The Refectorio, the abbey’s original dining hall with a vaulted Gothic ceiling and a 17th-century fresco, that today is a Michelin Starred sanctuary of haute cuisine; the Vinoteca wine cellar serving tapas and small plates as well as offering wine tastings; and seasonal dishes, from salads to grilled meats, enjoyed al fresco in the spring and summer months in the Cloisters courtyard. Of the estate’s 1,730 acres of prime farmland, 500 acres are dedicated to the vine. The winery produces award-winning vintages of exceptional pedigree and is among the most advanced in Europe in combining ancient wine-making traditions with cutting-edge technology. Among the amenities and activities are 24-hour butler service, mountain biking and horseback riding on the estate, tours of the winery, helicopter rides to view the ancient landscape from the air, and Falconry displays. The open-air Hedge Museum on the grounds of the abbey showcases the sculptures of contemporary artist Ulrich Rückriem, who extracts massive stones from the earth and reassembles them on its surface. Abadía Retuerta LeDomaine is a two-hour drive or train ride from Madrid, and a 30-minute drive from Valladolid. For further information and reservations: www.ledomaine.es; reservations@ledomaine.es; Tel. +34 98 368 0368.
article? I’d really love to be a part of community where I can get suggestions from other experienced people that share the same interest.